“What is an aphorism? 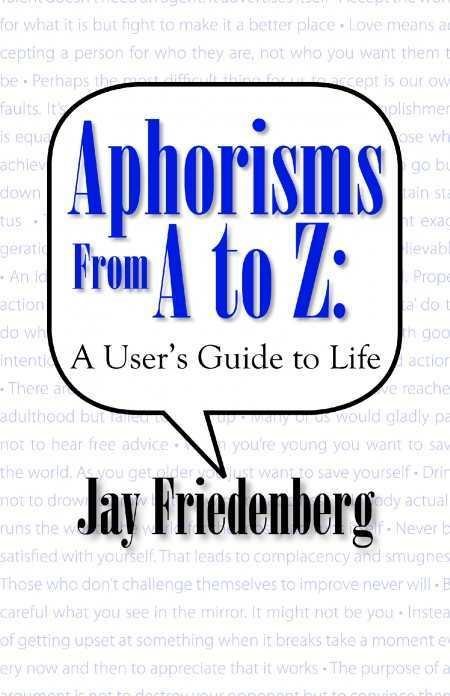 In brief, it is a short saying that states a general truth.” In his book, Jay Friedenberg, chair of the Psychology Department of Manhattan College, pursues one of his many interests: the exploration, definition, and creation of aphorisms. There are some obvious defects in the book, such as the misspelling of “Imitation” as “Immitation” for one of the category headings. And there are not just a few ungainly constructions. For example, Friedenberg writes, “Even when people are honest there are still circumstances beyond our control that require the need for enforced contracts.” There are no offerings for the letters X or Z—no “Xenophobia,” no “Zeal.” These anomalies indicate a less than total dedication to the polishing of the work, as though the author grew tired of the task toward the end. Friedenberg’s students and fellow aphorists will probably comprise the audience for this book since it is, more than anything, a hobbyist’s fancy.